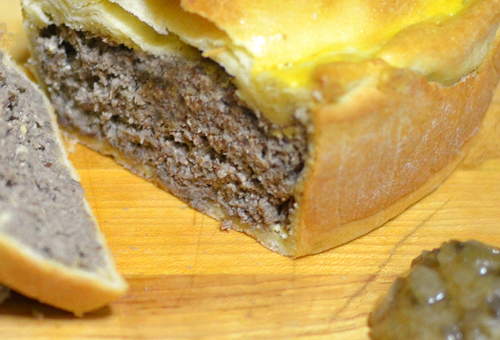 Home Tags Posts tagged with "Latvia"
The last entry in my series of national dishes was Kazakhstan’s beshbarmak. This time, we’re hopping to the Baltic to try Latvian piragi. Naming a single national dish for a whole country is a very artificial exercise. For Latvia, Wikipedia suggests latke, and sure, Latvians eat potato pancakes, probably tons of them, but… so does the rest of Eastern Europe. Roasted Montreal suggests grey peas and bacon, but that evokes a rather sad image of Latvian food (and what the heck does Roasted Montreal know about it, anyway?). Cooking Latvia hints at piragi, and their recipe is featured in Ingredient Matcher‘s compilation of national dishes. That sounds like a much better choice to me. They’re more unique and appealing. Just don’t get piragi confused with pierogi! Though the etymology’s the same, the recipes differ on some important points, and a pirags (singular pirags, plural piragi) actually has more in common with a Russian pirozhok. Kind of. But I must not have eaten piragi while I was there, or I definitely would have remembered. The typical pirags is a crescent-shaped baked pastry filled with onions, bacon, and sometimes other meats. Traditionally, piragi are made only for special occasions and in very large quantities. And like most things with dough and bacon, they’re very addictive. My first encounter dates only from a year or so ago, and was almost fortuitous. Through my daughter, we had recently made friends with a fellow French-American family, and the American half of the parental pair turned out to be an avid home cook with a Latvian background. For our first dinner at their place, Erika made her famous piragi, following her grandmother’s recipe. Over the course of one long evening, we probably ate over a pound of them per person! The recipe I’m presenting doesn’t differ much from Erika’s. The main change is my obsessive use of precise measurements for everything, so you won’t need to have a Latvian grandmother in order to get the recipe right on your first try. Erika mixes the filling in a food processor, and flattens the dough with the palm of her hand one nugget at a time. I, on the other hand, don’t own a food processor, and prefer using a rolling pin and a cookie cutter to work with the dough. The latter method results in more uniform pastries, but you can decide which approach you like best. I am also making my own pork belly instead of using store-bought bacon, but this is entirely optional. The trickiest part of the preparation is probably in shaping the piragi properly, so I’m providing a video below. Not that an imperfectly folded pirags will be inedible, but here at Food Perestroika, we like doing things the right way. The piragi are perfectly good all by themselves, and you can spend a wonderful evening stuffing your face with each batch coming out of the oven. If you want to make a more balanced meal, I recommend serving them with a mushroom soup and pickled vegetables. The earthiness of the soup and the tang of the pickles go particularly well with the meaty, smokey piragi. We’ll explore homemade pickling another day, but I’m attaching my mushroom soup recipe, vaguely inspired by various tomes in my cookbook collection (Pokhlebkin in particular). It contains a lot more vegetables than just mushrooms; you’ll find cabbage, onion, and carrot. The choice of fungi varieties is up to you. I’m using cremini, but one could replace them at least in part with wild mushrooms, fresh or dry — just keep in mind that their stronger flavors might require changes in the proportions. Place the water, smoked salt, curing salt, sugar, and black pepper in a blender, and process for a few seconds. Transfer to a bowl, add the pork belly, cover with plastic wrap, and marinate for about 12 hours. Take the pork belly out of the brine, and vacuum-seal in a sous-vide pouch. Cook in a 60 C / 140 F water bath for 24 hours. Reserve. In a rondeau pan over medium heat, sauté the cabbage, onion, and carrot in the butter until soft. Add the mushrooms, season with salt and pepper, and cook for 2-3 minutes, stirring regularly. Add 2/3 of the stock, bring to a simmer, then cover, and cook for about 5 minutes, until all the vegetables are tender. Return the soup to the pan, and add the heavy cream and crème fraîche. Slowly mix in the remaining stock, checking the texture as you go; you might need slightly more or less stock than what I call for. Rectify the seasoning with salt and pepper, bring to a simmer, and cook for another 5 minutes. Pass the soup through a chinois, and reserve. When serving, reheat over medium heat, pour into cups, and garnish with the green apple julienne and chopped carrot tops. In the bowl of an electric mixer fit with the paddle attachment, mix the milk, yeast, and sugar, and let rest for 5 minutes. Add the flour and cardamom, and combine on low speed. Melt the butter in the microwave with the smoked salt, and stir with a fork (the salt probably won’t dissolve completely, and that’s OK). With the mixer running on low speed, add the butter to the dough. Cover the dough with plastic wrap, and let rise for about 1 hour, until doubled in volume. Punch down, and let rise for another 30-45 minutes, until doubled again. In a saucepan over medium heat, sauté the onion in the canola oil until golden brown. Stir in the star anise, cook for another minute, and remove from the heat. In a bowl, combine the onion, ham, and pork belly. Season with black pepper; usually, the mixture won’t need salt. Measure half of the dough (about 250 g), and place on a floured surface. Knead in 15 g of the meat filling, then roll to a 24 cm x 32 cm rectangle. You will probably need to add some flour to prevent the dough from sticking to the rolling pin, but try to add only the minimum necessary. Cut into 8 cm diameter discs. Place a spoonful of filling on each disc. For the perfectionist, each pirags should consist of 14-15 g of dough and 10-11 g of filling. For the rest of us, let’s just say that you can fill them more generously than you would fill ravioli, because you can press some of the filling into the dough when you seal them. In fact, don’t hesitate to do that — having the filling partly mixed with the dough is what makes piragi so great, if you ask me. Fold each disc into a half-moon, seal the edges, then flip to fold the edges under, and curve the tips to shape like a crescent. The perfectionist will verify that they’ve obtained a 7.5 cm long, 2 cm wide crescent. Everyone else should just watch Erika’s hands in the video above. Below you can see three stages of pirags shaping: the open disc with the filling, the half-moon with sealed edges, and the final crescent. Reserve the dough trimmings. Transfer the piragi to a baking sheet lined with parchment paper or a Silpat. If you have the patience, let rest for about 10 minutes. Mix egg yolk and milk, and brush the piragi with this egg wash. Bake in a 190 C / 375 F over for about 14-15 min, until golden brown. Transfer to a cooling rack. Repeat the process with the other half of the dough. Then roll the dough trimmings from the first 2 batches, and make a third batch; the dough will be less airy, but still good. Eat the piragi while still warm. This curious dish — which has very little to do with actual cheese — was actually what first motivated me to start my Latvian Hare Trio. 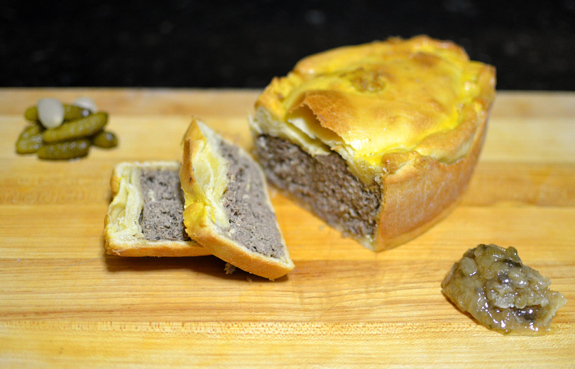 The final result may look like a traditional pâté, but the preparation is quite different. Lesley Chamberlain’s Food and Cooking of Russia and Pokhlebkin’s Cookbook of the Soviet Peoples both contain fairly similar instructions: take a hare, roast it, braise it, grind it, then cook an omelette, grind it, and mix everything together with mushrooms and butter before baking in a dish, optionally wrapped in pastry. I found that the result of this procedure had an unpleasantly dry mouthfeel, so I made several changes to improve it. In particular, cooking the leg meat as a confit was a big improvement, and it made little sense to use the precious hare loins. I also got rid of the bizarre ground omelette and used raw eggs to bind the forcemeat like a normal person. Finally, the onion jam and cornichons bring welcome touches of sweetness and acidity. In the bowl of an electric mixer fit with the paddle attachment, mix the egg, butter, and ricotta. Add the baking powder, salt, and half of the flour, and beat on low speed until homogeneous. Mix in the other half of the flour, and beat for one more minute. Cover and let rest for at least 30 minutes. Pour the contents of the hare leg confit sous-vide pouch(es) into a bowl.Shred the meat between your fingers, keeping large pieces, and discard the bones. Measure 9.5 oz meat and 1 oz cooking liquid (ideally the juices, not the fat), and transfer to a bowl. The rest of the meat is used in the second part of my hare trio. The cooking liquid can be refrigerated to separate the juices from the fat. Add the caraway, thyme, eggs, ricotta, butter, cognac, and porcini powder to the bowl, then combine with a fork. Process the mixture in a meat grinder using the small die, and reserve. Roll the crust dough into a 9″ x 12″ rectangle to line a terrine mold, plus a 4.5″ x 6.5″ rectangle to cover the top. Of course, the exact dimensions depend on your vessel — I’m using a 4.5″ x 6.5″, 32 fl. oz terrine mold. Line the bottom of the mold with parchment paper, then position the large rectangle of dough so that it covers the bottom and the sides. Fill with the hare mixture, pack well, then cover with the other rectangle of dough and tuck the edges into the mold. Carve out a chimney in the middle with the tip of a knife, and brush all over with the egg wash.
Bake the hare cheese in a 450 F oven for 15 minutes. Lower the oven temperature to 350 F, then bake for about 8 minutes more, until golden brown. Remove from the heat, and let cool. I recommend serving when still very slightly warm. If served cold, pour some of the hare confit juices (separated from the fat) through the chimney to fill in the gap between the meat and the crust. Cut the hare cheese into 8 slices. On each plate, serve 2 slices with 4 cornichons and 1 tbsp onion jam. 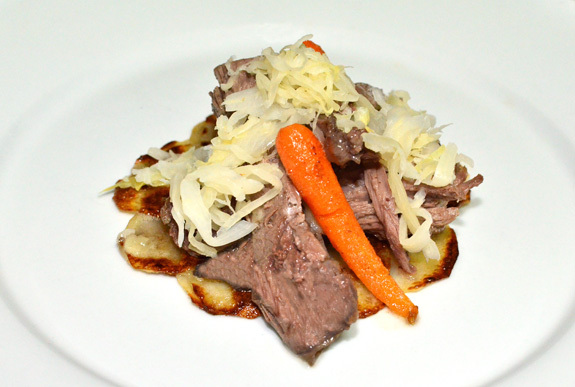 After last week’s hare loin, this post features the hare legs with another group of typical Latvian winter flavors: potato, sauerkraut, and animal fat. The recipe is pretty short, because most of the work has been done during the hare preparation. The only non-trivial element left is the potato pancakes. I’ve already talked about deruny here, but I’m taking a different approach today, simply slicing the potatoes and relying on the starch and salt to bind them all together. Finally, if you want to make the dish a little bit healthier but still recognizably Latvian, you could prepare a wine reduction to drizzle on the meat, instead of the fat! Black Balsam is a traditional Latvian herbal liqueur. Its recipe, created by a pharmacist living in Riga, is based on a composition of 24 different plants, flowers, buds, juices, roots, oils, and berries prepared in oak barrels. The drink itself is black and very bitter, but with a distinct sweetness to it. Admirers of chartreuse and the early novels of Poppy Z. Brite will love it. Others, maybe not so much. Legend has it that Catherine the Great became ill during a visit to Latvia and was cured after drinking Black Balsam — one sure has to hope that such a harsh-tasting beverage has some medicinal virtues to justify consuming it. Nowadays, however, a smoother version is available, mixed with blackcurrant juice. If you have trouble finding it in the US, try mixing regular black balsam (check availability here) with crème de cassis instead. What does this all have to do with today’s recipe, you might ask. Well, balsam and hare have more in common than it seems: they’re both consumed in Latvia, and both can be acquired tastes. Because Latvian cuisine gravitates around a somewhat limited number of ingredients, it made sense to me to try to pair them together — and I think the association works quite well. 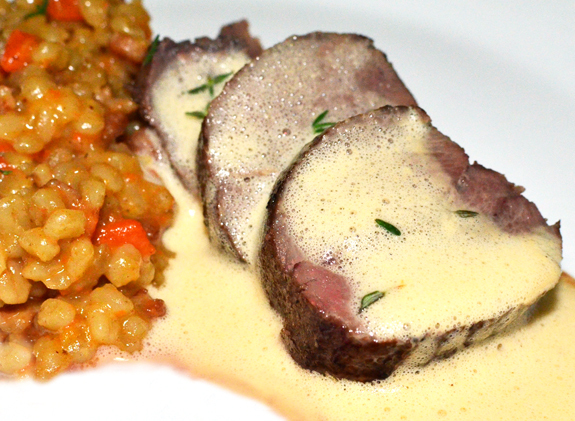 Barley, another staple of the region, was a natural accompaniment.